For R&D and production engineers working in the pharmaceutical industry, the real challenges commence after a new drug molecule has been discovered. They are then tasked with taking a process that has been designed and verified at a small-scale (such in a test tube or a micro-reactor) and successfully reproducing this at an industrial scale (for full production volumes). 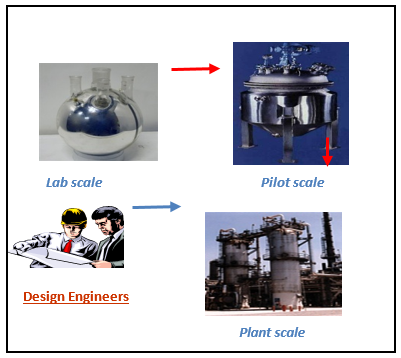 This process is typically done in two stages: 1) by first designing a process and validating it at the pilot-scale where equipment has a size of around a metre, and once this equipment is working robustly, then 2) scaling-up to production-scale which often involves a linear scale-up of a factor of 10, which is equivalent to a volumetric scale-up of a factor of 1000! To an outsider, an obvious question is often “As chemical processes have been scaled up for hundreds of years, why does the process remain so challenging?” The answer lies in the impact of scale on fundamental processes, such as mixing, chemical reaction, separation etc… When drug development experiments are performed using micro-scale reactors, the engineers are dealing with laminar flows which means that the effects of mixing, contact time between phases, selectivity of chemical reactions etc…. can be very tightly controlled and are easily repeatable. As soon as larger scales are encountered, the flow becomes turbulent which means that the mixing process is harder to control and unforeseen inhomogeneities can lead to a broader spectrum of residence times and mixture concentrations within the vessel, significantly reducing the efficacy of the process. The end result is a product yield that can be far below that of the optimal process that was developed at an experimental scale, and the need for additional separation processes to remove unwanted reaction products or unreacted material - all of which have a major adverse impact on the company’s bottom-line. 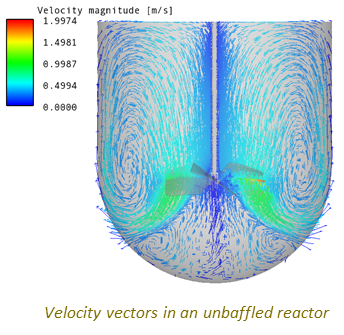 Fortunately, the use of Computational Fluid Dynamics (CFD) tools from ANSYS provides engineers with the ability to accurately design mixing vessel equipment at all scales (from lab to pilot-plant to production volumes) and, in doing so, deliver huge improvements to process efficacy and product homogeneity (with subsequent benefits to the bottom-line). How is this achieved? Well, rather than performing costly experiments at the intermediate “pilot-scale”, engineers are now conveniently able to design equipment using a virtual model which allows them to easily and accurately simulate the flow behaviour and understand the impact of all possible design parameters on the performance and efficiency of their process. Better yet, they are able to do this before they embark on expensive decisions such as equipment selection and construction commitment at production scale. Since they are working with a virtual model, it is also extremely simple to scale the model up further to determine if the process is going to work efficiently at the intended production scale. This process can be applied to a wide range of mixing technologies, including traditional stirred tanks but has also been applied to Oscillatory Baffled Flow Reactors (OBRs) and other devices. Engineers are also able to visualise and quantify the homogenuity of the product over various blending cycles, helping them to better understand mixing times required for each stage of the process, and to better plan the timing of key additions. Use of CFD to Visualise the Flow Field and to Identify Stagnant Zones, Regions of Poor Mixing, and the Torque on the Blade.